The artwork depicts the area's rural lifestyle and rich history of horse-keeping. An enamel steel art panel alongside seating on the station platform features an image of the region's well known landmark - Stoney Point Park. Hand-painted native flowers appear to grow larger than life in front of the mountains. The intricate blooms appear as specimens - evenly spaced testaments to the abundant natural beauty of the hills. Ellipse-shaped glass and stone mosaic artwork depicts a galloping horse. The image conveys speed and powerful motion while referring to a commonly observed alternative mode of transportation in Chatsworth. The horse is also evocative of the many foothill trails that are commonly traveled by the city's active equestrian community. "The dreamy-looking background is created from several shots of rocks and the iconic mountain in Stoney Point Park. Images of the park's native plant materials and individual flowers appear to grow in front of the background and take on a specimen-like character. 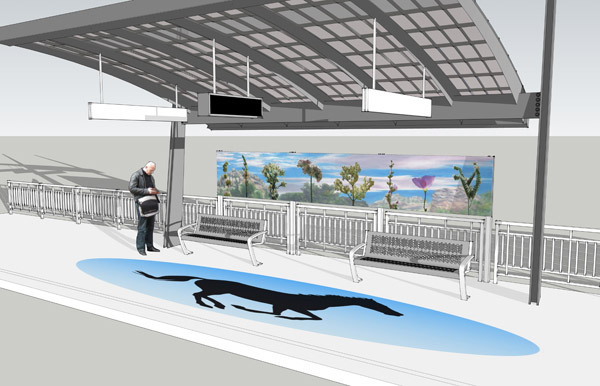 The salient features are those of beauty and nature and are meant to offer Metro riders an uplifting aesthetic experience based on the natural beauty of their community." LISA ADAMS has taught at the University of Southern California, the Claremont Graduate University and Otis College of Art & Design. Her work has been exhibited at galleries and museums in the United States, Asia and Europe. She has been an artist-in-residence in Slovenia, Finland, Japan, Holland and Costa Rica. Adams has been commissioned for public projects with BMW and the City of Los Angeles and her work can be found in the collections of Eli Broad, Laguna Museum of Art and the Frederick R. Weisman Museum of Art among others. She holds a B.A. in painting from Scripps College and an M.F.A. from the Claremont Graduate University. Her work is represented by CB1 Gallery. Adams blogs about art in Los Angeles for the Huffington Post.